Hello! TGIF! It seems like just yesterday I was writing a post about the weekend, and here another one is upon us. 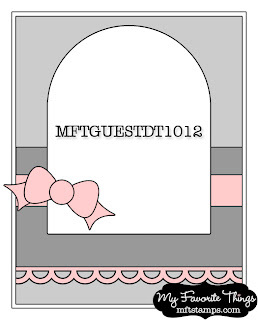 First I have a card that I made for the latest MFT Guest Designer Contest using the MFTGUESTDT1012 sketch. I started by stamping and coloring the sweet PI - Flurry of Love. I pieced her jacket and added some Platinum Stickles to the snowflakes. I used the Rounded Banner STAX to die cut my image, then I distressed the edges and cut the next size banner to mat her. For my bottom border, I used the Banner Strip Die, stamped "miss u" with the Typewriter Alphabet, and finally added some red rhinestones between each banner. I paired everything with some paper from the Basic Grey Aspen Frost collection and distressed the edges of my paper and cardstock. Finally, I tied a bow with some Kraft Grosgrain Ribbon and added a Natural Button with a bit of red twine tie through it. Accessories: Die-namics: Rounded Banner STAX, Banner Strip Die; Kraft Grosgrain Ribbon, Natural Button (MFT); Markers (Copic), Red Burlap Twine (May Arts), Rhinestones (Kaisercraft), Distress Tool (Prima), Stickles (Ranger), Foam tape, Thread, Sewing machine. Oooh!!! I LOVE her polka dot jacket with the striped scarf and hat!!! And the banner sentiment along the bottom is so sweet!!! This is DARLING!!!! Oh I like this a lot! 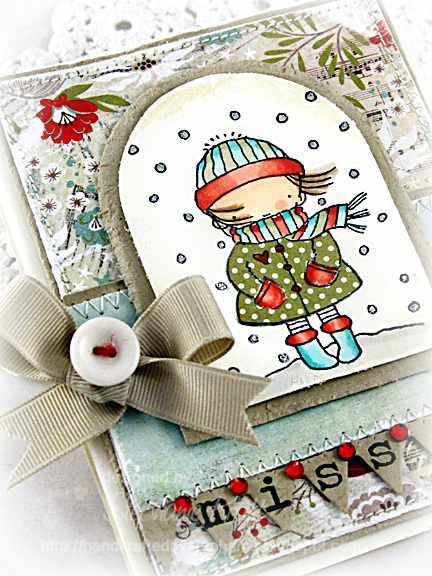 The image is gorgeous - she looks so warm, wrapped up in her coat, hat and boots! Love the colours. 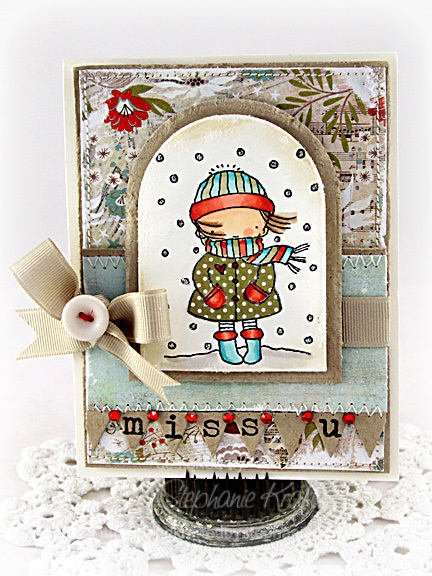 What a sweet image and I love your card. You did a great job! What a precious card!! I felt delightfully cold just looking at it!! You have such a gift!! LOVE this Stephanie - good luck! I love love LOVE this card. I think you might be a shoo in for next month guest designer spot with this one.